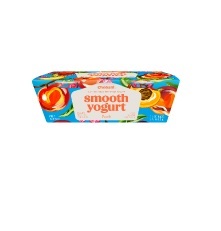 Free Chobani Smooth Yogurt, any variety (2/5.3 oz.) in Kroger stores, with coupon. This Kroger Free Friday Coupon is available for download on Friday, January 19, 2018 but you have until February 4, 2018 to redeem it. What is Chobani Smooth Yogurt? Chobani Smooth Yogurt is Chobani ‘s first non-Greek yogurt. The low-fat yogurt comes in five blended flavors: vanilla, black cherry, strawberry, peach, and blueberry. Ingredients: Lowfat yogurt (cultured pasteurized nonfat milk, cream), evaporated cane sugar, water, fruits, fruit pectin, fruit concentrate, natural flavors, guar gum, lemon juice concentrate, fruit and vegetable juice concentrate (for color), contains milk. Redeem your coupon in-store within 2 weeks for free Chobani Smooth Yogurt, any variety (2/5.3 oz.). Your coupon will automatically be applied at checkout when you use your Shopper’s Card. Available in most stores.